2014 Best Restaurateur in the U.S.
Daniel Boulud has become synonymous with some of the most luminous French cuisine in America. At his Manhattan flagship restaurant Daniel – which celebrated its 20th anniversary in 2013 – seasonal menus are rooted in the best of Gallic tradition, executed with exquisite technique, yet also resonant with vibrant contemporary touches. His fine dining and more casual bistros dot the globe; he has written eight cookbooks, starred on TV, and received praise from critics, colleagues and fans alike. His journey to become a leading French chef in the U.S., and ultimately, as he sees it, an "American chef with a French soul," is indeed a compelling immigrant story. Boulud was born in Lyon, France, and raised on the family's farm outside the city in the village of Saint-Pierre-de-Chandieu. He became interested in cooking at an early age, and he recalls the first dish he made for his parents at age fifteen. He says they could never have afforded the Dover sole soufflé stuffed with lobster, sole mousse and truffles and braised with lobster sauce at the restaurant he was working, so he brought the restaurant home to them. That year, still aged fifteen, he was a finalist in France's competition for Best Culinary Apprentice. 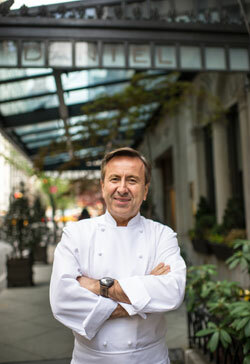 The young Boulud worked with Roger Vergé, Georges Blanc and Michel Guérard before cooking for a stint in Copenhagen, and then moved to the U.S. in 1982. He cooked in Washington, D.C, and then New York, and from 1986 to 1992 he flourished as the much-acclaimed executive chef at Sirio Maccioni's Le Cirque. 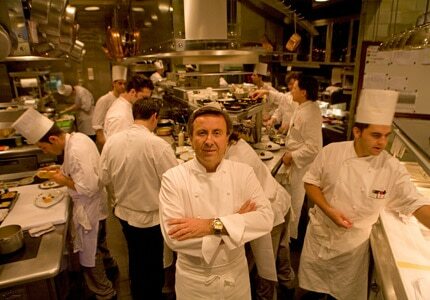 Towards the end of his tenure at Le Cirque was Boulud's turning point. His daughter was born in 1989, and he wanted to go back to Lyon, but he had promised Le Cirque he would stay five years. Even as he was looking to return to France, he came to the soul-searching realization – an epiphany perhaps – that New York was his city, so he decided he would stay. He knew his destiny was to become an American chef, though he admits that he still thinks in French every day; but the inspiration of America, with the energy of ambitious chefs surrounding him from many cultures and cuisines, was too exciting to abandon. He has lived in New York ever since, and not looked back. Setting out on his own, Boulud's eponymous restaurant Daniel was launched in 1993 on the Upper East Side of Manhattan, and relocated in 1998 to 65th Street at Park Avenue in the former Le Cirque space. Café Boulud then opened in the former Daniel space (completed by the elegant adjacent Bar Pleiades), and the shift from chef to chef-restaurateur was complete. Aside from his sheer talents, he was also one of the hardest working chef/restaurateurs. In 1997, Boulud and a team of business partners created The Dinex Group, and set in motion new Boulud adventures that would unfold across the city – and then the globe. 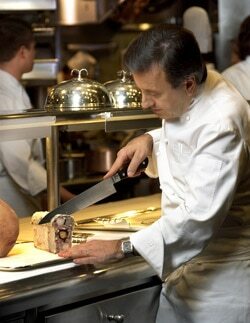 Expanding to a wider Manhattan audience was easy, as Boulud was much beloved by loyal followers. The contemporary and more relaxed db bistro moderne opened near Times Square in 2001, and in 2008 his group went on to open Bar Boulud, a casual bistro and wine bar across from Lincoln Center. Next followed DBGB Kitchen & Bar on the Bowery; and then back up to the Upper West Side in 2011 with the Mediterranean-themed Boulud Sud. These last two venues allowed Boulud to expand beyond strict French cuisine, exploring Provençal Mediterranean cooking with Occidental Turkish accents and American brasserie items like burgers and matzo ball soup. Finally, the chef created the bustling Épicerie Boulud, a market and café offering house-made charcuterie, sandwiches, soups, fresh breads and pastries, as well as housing an oyster and wine bar. Boulud's vision was to create and connect tiny versions of the French boulangerie, charcuterie, fromagerie, viennoiserie and pâtisserie by using the talent pool among his restaurants. For the retail store, he extended the charcuterie program at Bar Boulud and DBGB; he has seven bakers working for the restaurants full time, and perhaps 50 pastry chefs overall, many of whom are involved in supplying the Épicerie Boulud, thus fulfilling his desire to offer the finest house-made, handcrafted quality food in a democratic (for New York) medium. Boulud notes that he, along with a vanguard including fellow Gauls Jacques Pépin and André Soltner (followed by Jean-Georges Vongerichten and Éric Ripert ), has helped set the standard for French cuisine in America and made New York its pinnacle. He has changed the culinary landscape here by firmly establishing classical French technique but adapting it to American seasonality and ingredients. His dinner menu might offer stewed Alaskan King crab with Hawaiian hearts of palm, a chorizo-stuffed rabbit saddle, venison pâté en croûte, or a tasting of local Satur farms celery root with black truffle. Life in New York gives Boulud a culinary brotherhood, and he feels satisfied to have established a legacy here for French cooking, and built a foundation for a new generation of up-and-coming chefs. Other things he loves about New York? Noshing on sushi after midnight, and going to hear late-night jazz in Harlem. 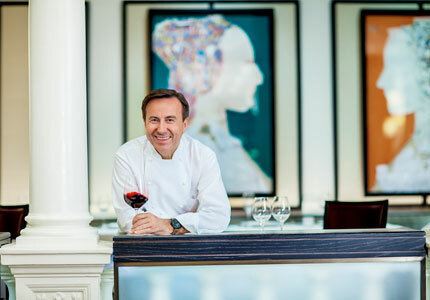 While he took Manhattan, Boulud was also rolling out restaurants worldwide – from a Café Boulud in Palm Beach and Toronto, outposts of db bistro moderne in Miami and Singapore, a Bar Boulud in London, and Maison Boulud at The Ritz-Carlton in Montréal. He also had a successful run in Beijing's Legation Quarter with a Maison Boulud which closed this past year, although the chef is looking to open a new Beijing venue in the future. Daniel Boulud is a chef loved by his dining public, the young chefs he has mentored, and his culinary peers; he has been honored with many accolades from The James Beard Foundation, been named "Chef of the Year" by the Culinary Institute of America, and awarded the Chevalier de la Légion d'Honneur by the French government. Indeed, Daniel has consistently been named every year to our own GAYOT Top 40 Restaurants in the U.S. since the list's inception a decade ago. Despite his growing portfolio of successful restaurants, Daniel Boulud continues to be modest; as importantly, he continues to evolve. His belief in collaboration with his chefs and suppliers, his excitement with the turning of each season and the opportunities it will bring, and the inspiration that still springs from his imagination to keep his dishes dazzling year after year, are qualities that endure. Boulud's odyssey from Lyon to America is far from over; in fact, he told us that his dream is to "... open a small restaurant in Lyon. Maybe take back an old bouchon...." In the meantime, this self-proclaimed "New York chef" keeps on bringing his adopted country new culinary excitement, and for this we salute him.